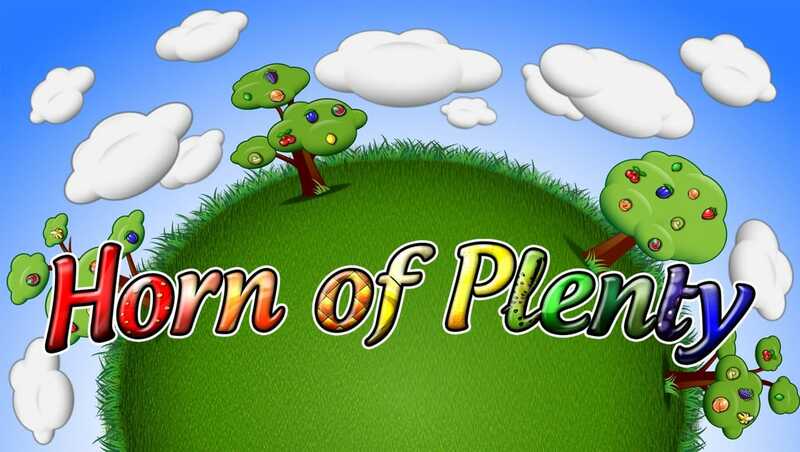 If ever there was a new online slots game that stood out from the crowd it would be Horn of Plenty Spin 16 from the team at Genii. This unique slot game is vibrant, colourful and comes with an interesting feature that will keep you hooked after your first spin. Get the best out of our deposit bonuses for slots before you play the game! Search SlotsBaby for all the best and latest games by Genii. Arguably one of the best suppliers of online slot games and gaming technology in the gambling industry. Genii is comprised of a team of talented developers and have been creating entertaining titles since the 1990’s. With a massive portfolio containing over 130 games, they’re quickly cornering the market of mobile and smart device gaming. The first you notice about this game when you load it up is just how bright and cheerful it is. Set against a warm sunny day on a picturesque field, this slots reels are filled to the brim with various succulent fruit in a design choice that’s rarely seen in fruit-based slots these days. Aside from its art style there’s one other feature that you will definitely spot in this slot and that is the fact that the reels don’t have to spin like other games. What we mean by this is that in Horn of Plenty Spin 16 you can spin any of the reels in any direction you want by simply clicking on them and dragging them in the direction you want. 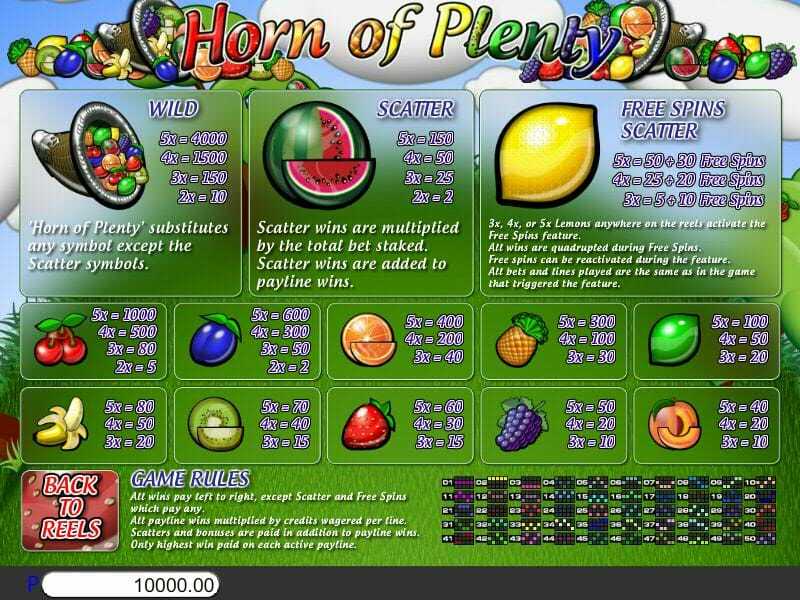 This opens up more paylines combinations than normal slots and allows the game to provide some interesting bonus features that compliment this design choice. SPIN BONUS: On the side of the reels are various arrows in different directions. A yellow arrow marks where you picked to spin and a green arrow will rotate around reels and if it lands exactly where you chose at the start then you will get a 10x multiplier. If it matches the reel you picked but on the opposite side you will get a 5x multiplier. Or if it just lands on the same direction you will earn a 2x or 3x multiplier. So, there are plenty of ways to win in this game. WILDS: The titular Horn of Plenty is WILD in this game and it will substitute for other symbols in your lines except the Scatters. 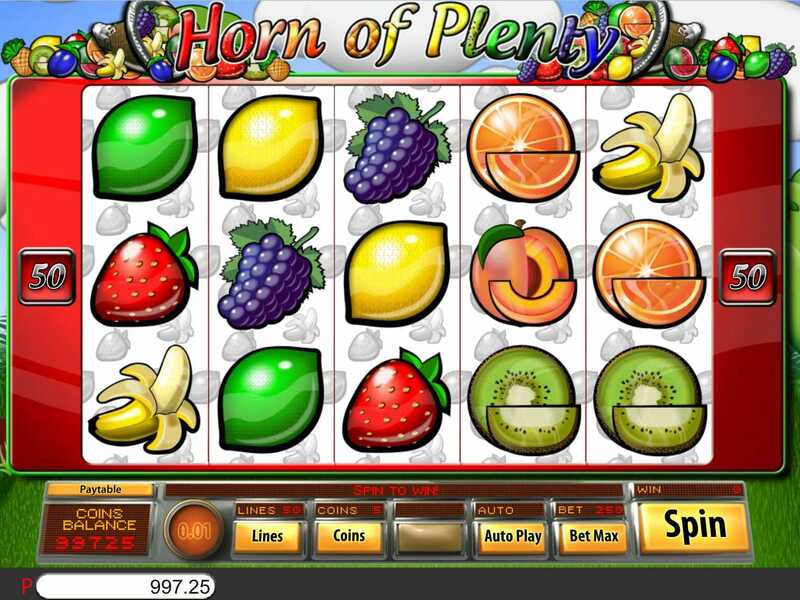 SCATTER BONUS: There are two Scatter symbols in this slot game, they are the melon and the lemon. If you land at least three of these in one of your paylines you will earn a multiplier based on the number of Scatters.